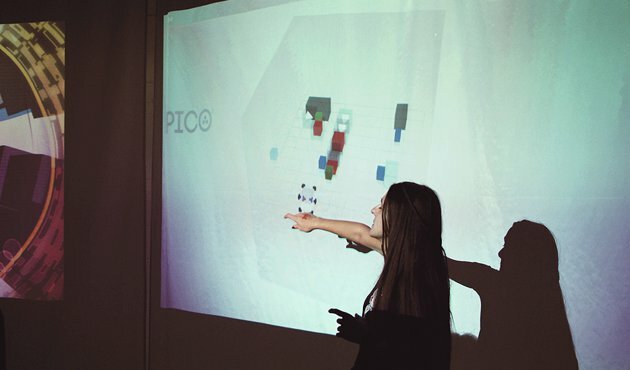 Pico³ is a game I made with Aliceffekt (as Les Collégiennes) over the course of a month, and that we presented at the Prince of Arcade party on November 9th. Aliceffekt designed the game mechanics, levels and visuals, while I took care of all programming and procedural animations. Emitters emit cells of a primary color (red, green or blue). Receptors expect cells of a certain color, or color (ordered) sequence. You can place Projectors that redirect cells or combine them, if different cells hit the projector simultaneously. The challenge is to combine colors at the right time, with the given resources and world layout. 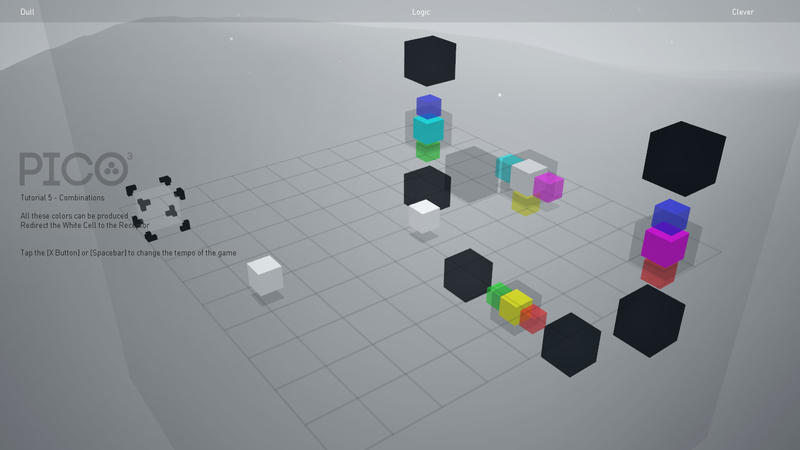 It becomes an intricate resource management/puzzle game, and even the simplest-looking puzzle can prove almost impossible! It is played with mouse+keyboard on all platforms, but also supports the Xbox 360 gamepad (either wired or wireless with an USB receiver) on Windows by using Rémi Gillig’s XInput.NET for Unity. I made my own wrapper over it to detect press/hold/down, actually the code was ripped out of my XNA code. That’s the fun part of using C# scripting, I can just share code between projects even if it’s not the same technology! Hope you like it, it was a a lot of fun to make and I’m already looking forward to my next Unity creation… It’s a great work environment. The game I made with Matthew Gallant and Henk Boom (us three being the “No Fun” collective) at ToJam earlier this year is finally out! P.S. : Did you notice the new Games page on the top menu-bar? It keeps track of all the games I worked on, with links to blog posts and download links. Check it out!